Although there’s been a live album, split and compilation since 2002’s Hate Breeds Suffering, for many the grind supergroup might as well have been split up altogether, making the sudden appearance of a third full-length something of a surprise. A pleasant surprise, that is – any project featuring Napalm Death’s instantly recognisable bassist Shane Embury is sure to be worth at least hearing once, so I would be happy to listen even without At The Gates’ Tomas Lindberg on vocals. The duo are joined by journeyman drummer Nicholas Barker (ex-Cradle Of Filth and Dimmu Borgir most notably) and Chilean guitarist Anton Reisenegger of death/thrashers Criminal, the latter replacing the late Jesse Pintado who’s input was particularly notable in making past Lock Up albums sound like Napalm Death. With the change, you might expect Necropolis Transparent to be a step away from the group’s signature grind, yet aside from an ever-so-slightly more polished production (you have to listen to newer material next to the old to really notice) it’s still the same old storm of Napalm it has always been. Fans of Napalm Death can, then, rest assured in the safe knowledge that Necropolis Transparent kicks serious arse, but all grinders should be listening to this. It’s most comparable to one of the pre-Code Is Red... comeback albums from the Brummies, perhaps 2000’s Enemy Of The Music Business for sheer, outraged heaviness. There’s a neck-damaging old-school vibe that will remind you of classic Terrorizer – not quite as good as that supergroup of course, but by all the gods, Lock Up know how to make up for their less than exciting name with some superb grind. Death metal influences are forged deep into the heart of their sound, giving colour to the music without dominating it, as punk-influenced grindcore sometimes can be. They also share Napalm Death’s skill of giving their grindcore an atmospheric quality, less about crushing the listener as taking them to some dark otherworld where they can’t help but focus on the vocals as if they were addressed to them directly. The difference is, however, that Lindberg never has Barney Greenway’s knack of fuelling you to do something about it said awfulness – he just revels in the sheer horror of it all. 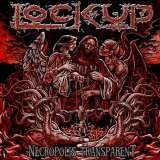 Lock Up is therefore something of a different experience to Napalm Death, giving the music the free reign to ride off into landscapes very hellish indeed. Moments like Anvil Of Flesh hold you in their grip, the spell of sheer sensory overload only broken on the track’s abrupt ending – this is exactly what the best grindcore should be about, in my view. The times I stopped writing this review in distraction by what I was listening to were countless, caught by a specific riff or particularly unhinged howl from Lindberg, who I am sure never sounded this good in At The Gates. By the time the album had finished I was practically exhausted, given a great grind workout and nursing a sore neck. Subsequent listens solidified the proof – Lock Up have given us another winner.